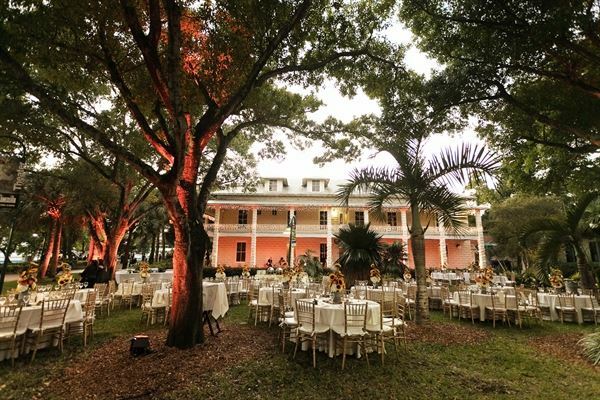 When you choose the New River Inn as the venue for your event, you are selecting the most unique urban oasis in Fort Lauderdale. Nestled in the heart of Riverwalk Park, the New River Inn provides your guests with lush grounds and a charming atmosphere. We invite you and your guests to celebrate in the historic heart of downtown. Name Brand Bar Service for Four Hours. Dining room of the historic New River Inn. Atmosphere/Decor: Sunny dining room in the oldest commercial building in Fort Lauderdale. Can be set classroom style for a corporate training, with 48" rounds for luncheon or dinner, or with hi-top tables for a cocktail reception. Special Features: Full IT package. The extensive riverfront grounds of the New River Inn can accommodate up to 1,000 people. Atmosphere/Decor: 1905 New River Inn surrounded by canopy of Live Oak trees on the New River in downtown Fort Lauderdale. Special Features: Expansive front and back lawn of the New River Inn are nearly 90% shaded by century live oak trees. Special Features: Beautiful location with indoor and outdoor party opportunity. Lowest pricing on the Riverwalk, Fort Lauderdale!